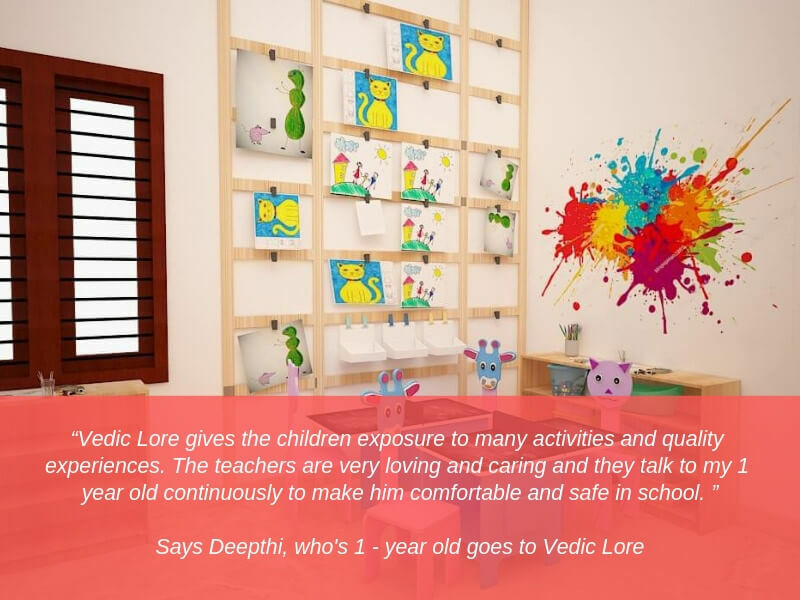 Vedic Lore Preschool has a very unique approach that your children will love! This preschool has a very unique approach that your children will love! Looking for a preschool in and around Manyata Tech Park? 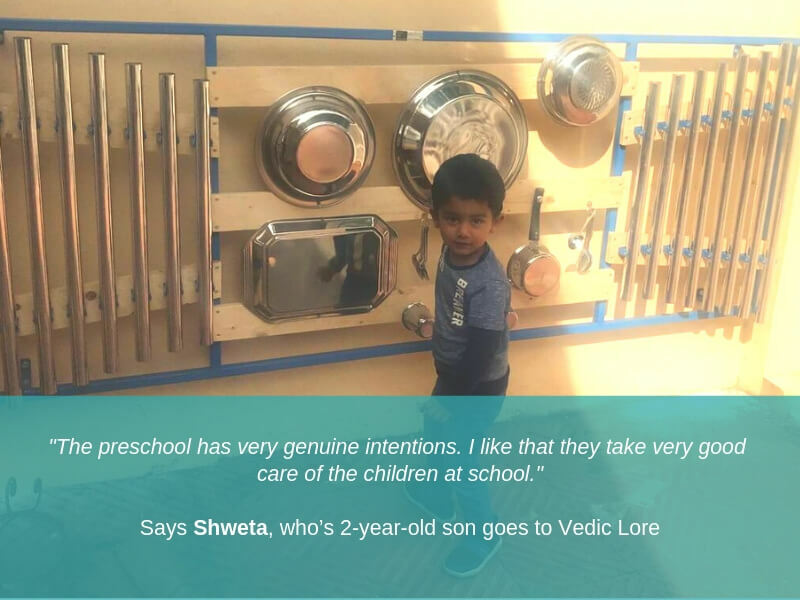 Here’s why Vedic Lore offers something much more special than just a regular preschool and day care environment. As soon as you walk into Vedic Lore in Manyata Residency, you will be dazzled by the beauty of the outdoor space. You may also see a few parents sitting in the gazebo, waiting in case any of their little ones were taking time to adjust to being away. 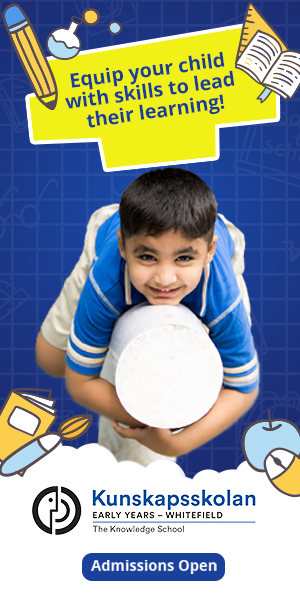 The preschool and extended care is co-founded by Ishwarya Iyer, Divya Anukul, Neha Arora and Rizwana Taj. There are many preschools near Manyata Tech Park but Vedic Lore offers very precious and handcrafted experiences for the little ones. There are very special reasons why parents love this preschool. 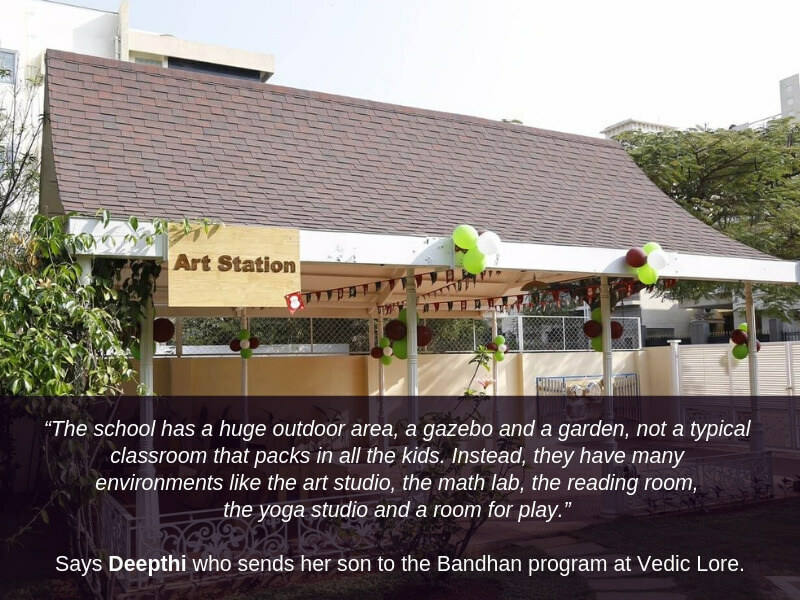 Vedic Lore has a huge garden area, ample space and many different environments for the children to learn from. There is a lovely sensory path in the middle of the garden, a music wall in the corner (made up of pots and pans, and the kids love these!) a large art studio and even a large bullock cart that is used to give rides to the children during festivals! For its early years’ curriculum, Vedic Lore uses Montessori and Waldorf material to implement a teaching strategy that is largely inspired by the Kindergarten and Cambridge styles. 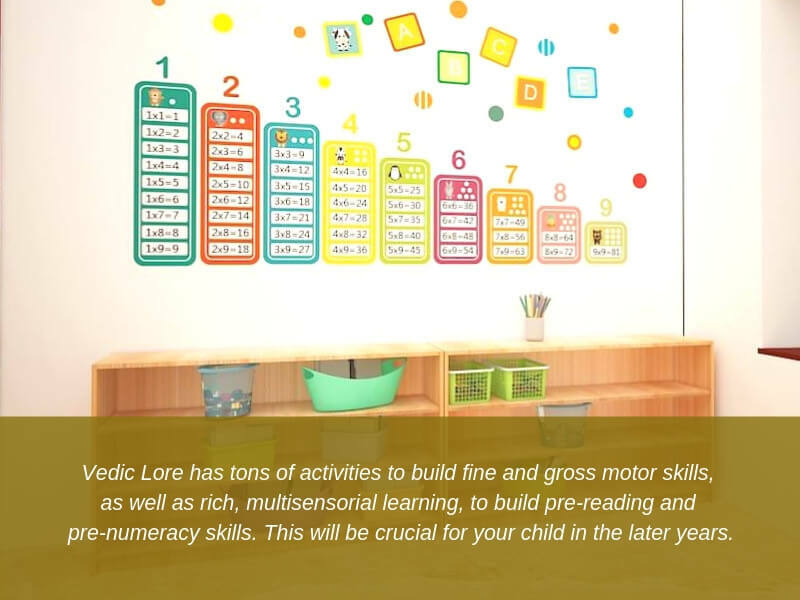 Vedic Lore has tons of activities to build fine and gross motor skills, as well as rich, multisensorial learning, to build pre-reading and pre-numeracy skills. This will be crucial for your child in the later years. Vedic Lore has a great team of qualified Montessorians, NTT and Waldorf teachers, from India and around the world. The principal of Vedic Lore is Sujatha Krishnan, who was part of the initial team of members who started the early learning foundation of the Bangalore International School. The preschool’s curriculum is crafted under the able guidance of an advisory panel with members like Mrs. Munira Akthar, Head of Montessorians United, and Mrs. Aruna Iyer, Head of Greenfield Public School, among others. The preschool takes health and safety very seriously and has one of the best paediatricians on board to assist with children’s safety and care. The members of the preschool and extended day care are all CPR certified and trained. You will be blown away by the range of activities that Vedic Lore brings into the preschool for toddlers and pre-schoolers. 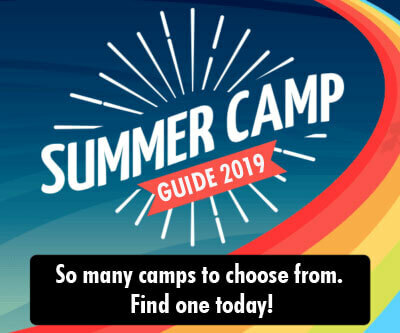 Authors, yoga practitioners, artists, storytellers, gardeners, musicians, dancers, sportspeople and more – the guest faculty list is pretty extensive! For instance, Ashok Rajagopalan, the author of the famous Gajapati Kulapatti books, did a reading and a workshop! The preschool’s librarian, Muthamma B Devayya, is one of the founders of Funky Rainbow, India’s famous traveling children’s bookshop. True to its name, Vedic Lore offers many avenues to explore the child’s Indian identity and heritage, including shloka learning, classical singing and dancing. For their library, only books by Indian authors are selected. The day begins with a prayer and the national anthem, and yoga is an integral part of every program. 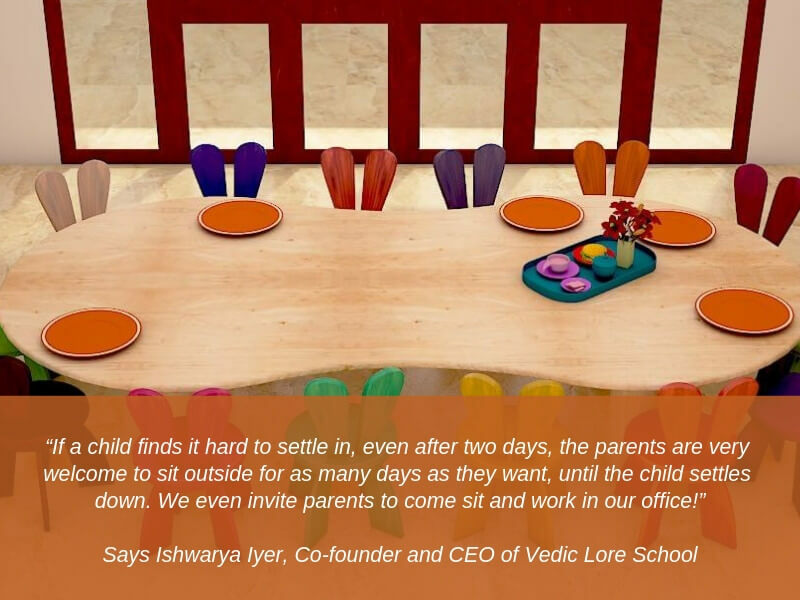 Vedic Lore solves a key pain point that many parents have – it reimagines the preschool environment as a space that is more than just a day care or playgroup environment. It brings in rich early years’ experiences to its children! * This is a sponsored post in collaboration with the brand.